"Root" is the superuser of your server, with wide-reaching access privileges. In some cases, enabling root access may be required when configuring your server. However, root access is not enabled for customers by default on the DV for security reasons. If you find that you need to enable root user access or update the root user password, this can be done via the admin section of the Account Center. For security purposes, it is recommended that root access only be enabled if absolutely necessary. Once root access has been enabled, it cannot be reversed. Log into your AccountCenter and select the primary domain for your DV server from the Domains drop-down menu, or use the Admin button from the Overview page (pictured). This will take you to the Control Panel for your DV. 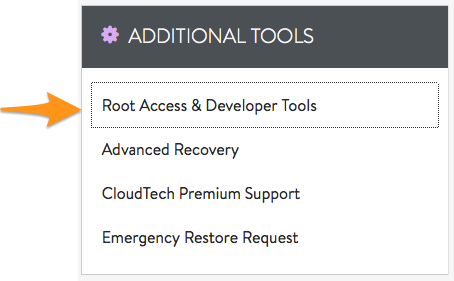 Select the Root Access & Developer Tools option from the Additional Tools menu. Click on Enable Root Access. Enter the reason for enabling Root Access, and agree to the terms and conditions by checking the â€œI agreeâ€ option on the screen. Enter and confirm your password. Use a password that is "strong" password that adheres to the Password requirements as shown and click Change Password. For more information, please see our Strong Password Guide. You now have root access enabled on your server!